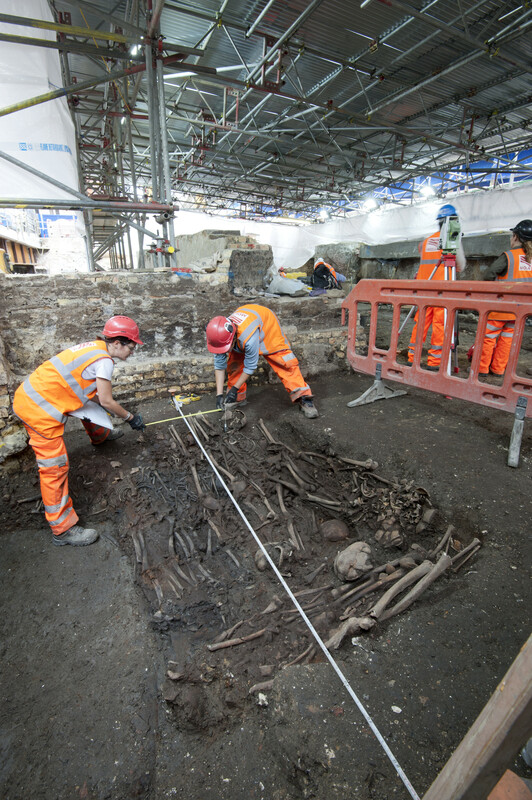 Suspected 1665 Great Plague pit unearthed at Crossrail Liverpool Street site - Crossrail . For information about the Elizabeth line please visit the Transport for London website. 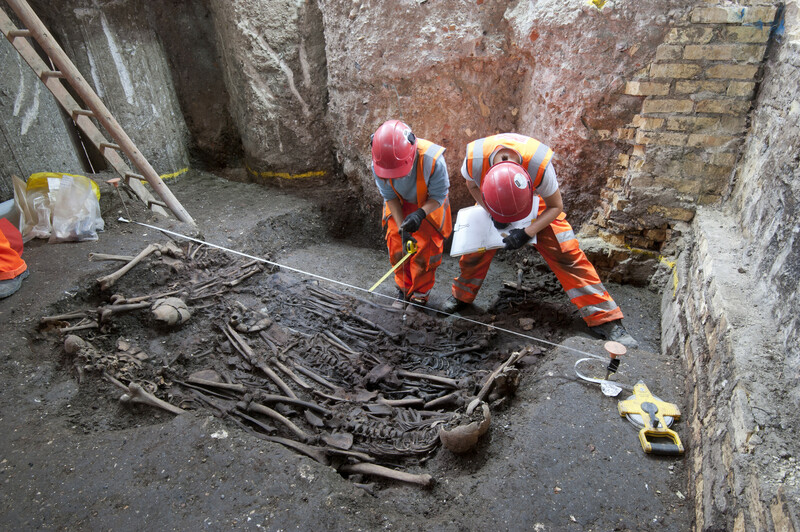 A mass burial site suspected of containing 30 victims of The Great Plague of 1665 has been unearthed at Crossrail's Liverpool Street site in the City of London. 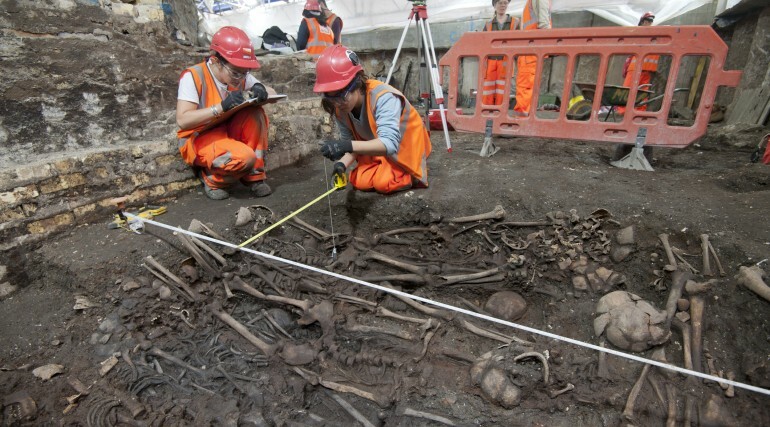 Jay Carver, Crossrail Lead Archaeologist said: “The construction of Crossrail gives us a rare opportunity to study previously inaccessible areas of London and learn about the lives and deaths of 16th and 17th Century Londoners. A headstone found nearby was marked ‘1665’, and the fact the individuals appear to have been buried on the same day, suggest they were victims of The Great Plague. 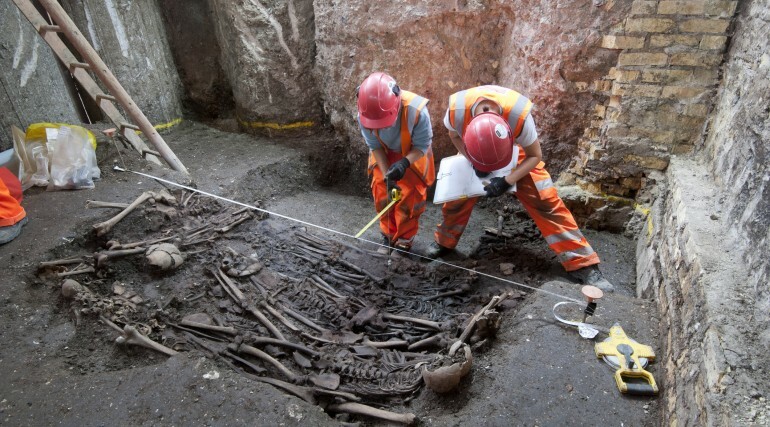 The thin wooden coffins have collapsed and rotted, giving the appearance of a slumped and distorted mass grave. 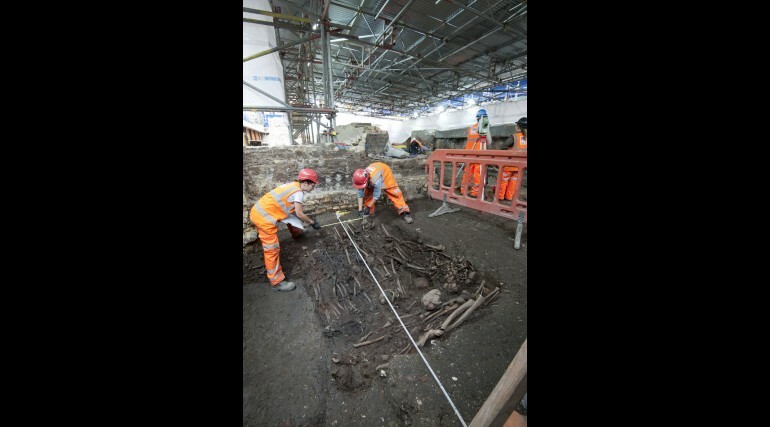 The skeletons will now be analysed by osteologists from Museum of London Archaeology (MOLA), and scientific tests may reveal if bubonic plague or some other pestilence was the cause of death. 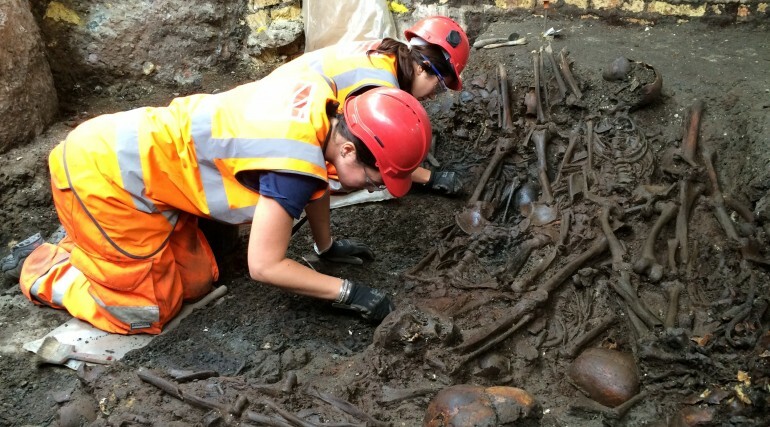 Excavation of the Bedlam burial ground began earlier this year. 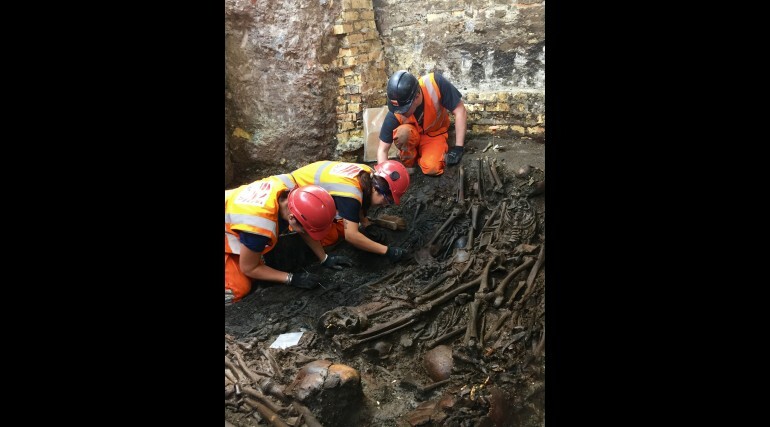 The team of archaeologists from MOLA have carefully excavated over 3,500 skeletons from what is, in archaeology terms, London’s most valuable 16th and 17th Century cemetery site. 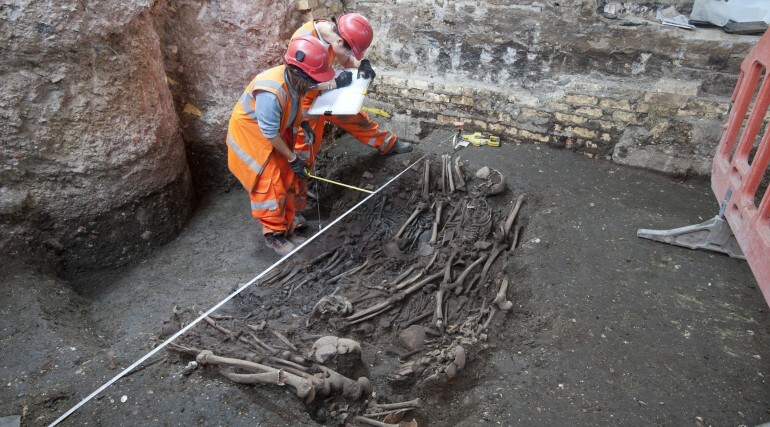 The Bedlam burial ground was in use from 1569 to at least 1738, spanning the start of the period of Elizabethan explorers, the English civil wars, the Restoration of the Monarchy, Shakespeare’s plays, the Great Fire of London and numerous plague outbreaks. 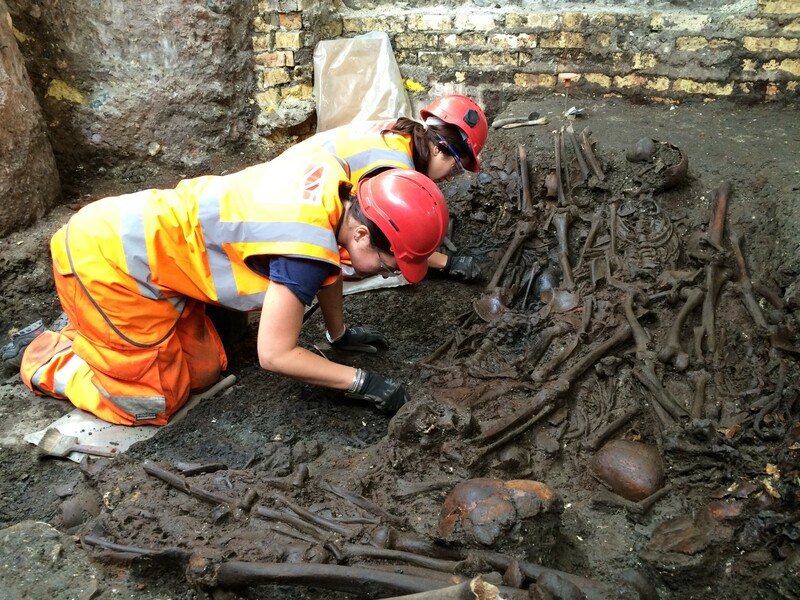 The Bedlam burial ground, also known as the New Churchyard, was located at the western end of Liverpool Street. 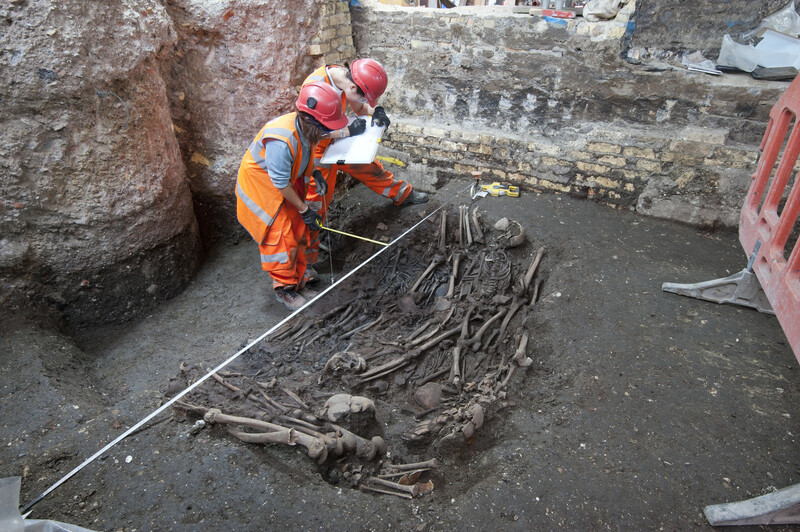 The recent excavation suggests that 30,000 Londoners were buried at Bedlam between 1569 and 1738. It got its name from the nearby Bethlehem Hospital which housed the mentally ill, although only a small number of Bedlam residents are believed to have been buried there. 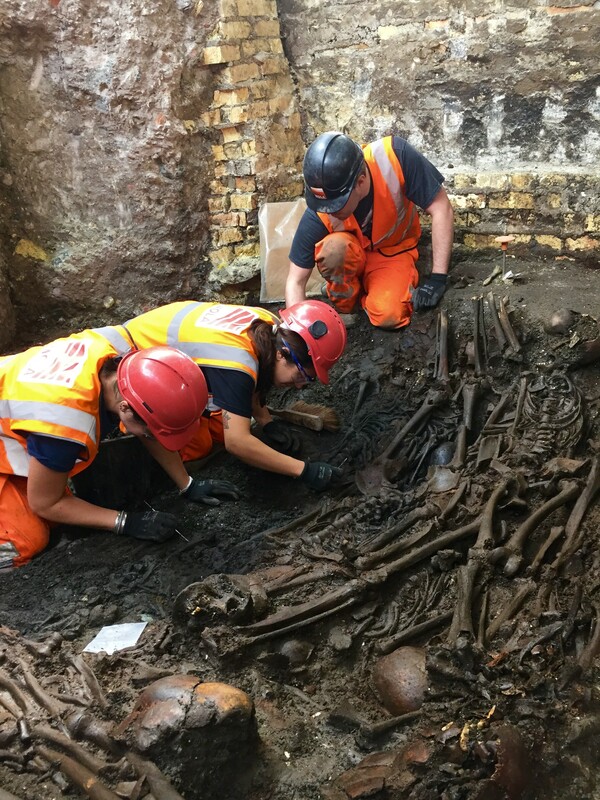 Using an innovative 360 degree video capture, the short film lets viewers step into the shoes of archaeologists from Museum of London Archaeology (MOLA) who are carefully excavating the burial. To watch this 360 degree video you will need the latest version of Chrome, Opera or Firefox on your laptop or desktop computer. On mobile and tablet, use the latest version of the YouTube app for Android or iOS. 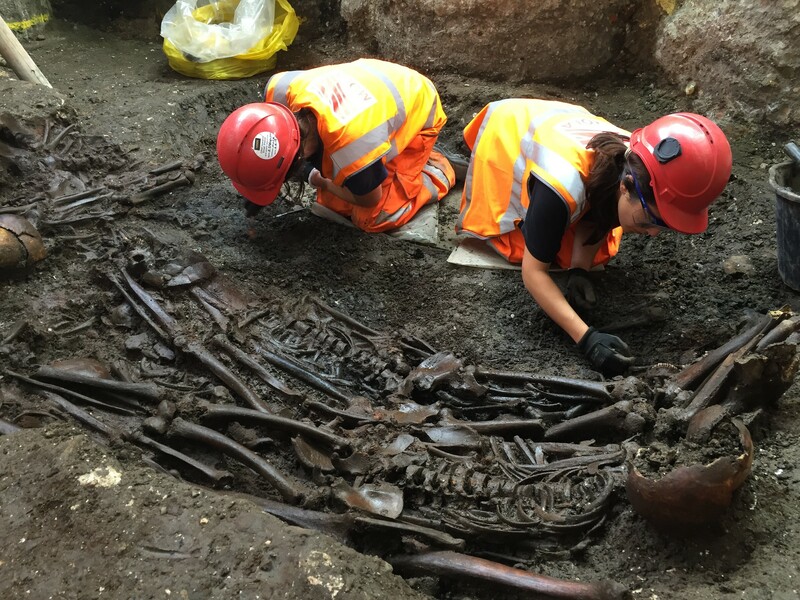 To date Crossrail has found more than 10,000 artefacts spanning 55 million years of London’s past at over 40 construction sites. 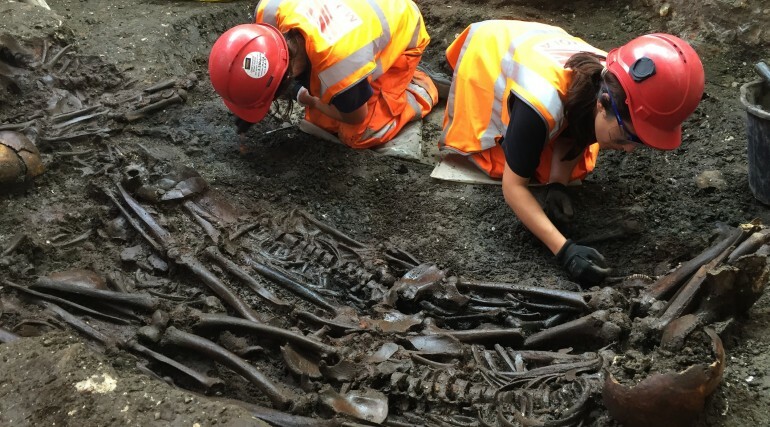 It is the UK’s largest archaeology project. 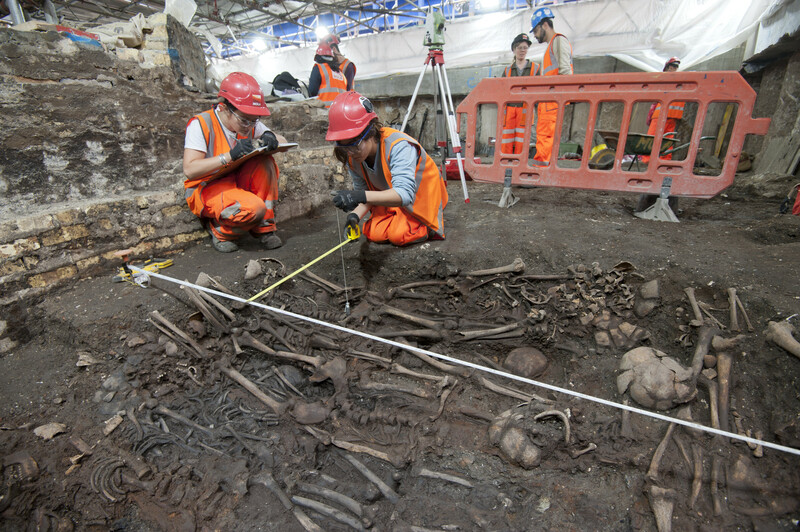 Preliminary excavations at the Liverpool Street site in 2011 and 2012 uncovered more than 400 skeletons and numerous artefacts. The total funding available to deliver Crossrail is £14.8bn. The Crossrail route will pass through 40 stations and run from Reading and Heathrow in the west, through new twin-bore 21 km (13 miles) tunnels to Shenfield and Abbey Wood in the east. When Crossrail opens it will increase central London's rail-based transport network capacity by 10%, supporting regeneration and cutting journey times across the city. Crossrail services are due to commence through central London in 2018.